It was only a matter of time before some major studio made a movie out of Slender Man, the frightening internet meme about a faceless, gaunt and tentacled specter who kidnaps children and also loves photo bombs. He seems tailor-made for classic Hollywood boogeyman status, with a distinctive character design, a creepy gimmick and a preordained cinematic style, which dictates he must always be looming in the background, like the killers in “The Strangers” but with a better tailor. Sylvain White’s “Slender Man” was not worth the wait. The film takes what might be the most fascinating 21st century horror monster and does almost nothing with him. It’s slow, it’s boring, and it’s not scary. The horror in “Slender Man” could be easily replicated… for free… at home… by turning off the lights and playing atonal violin music on your laptop. 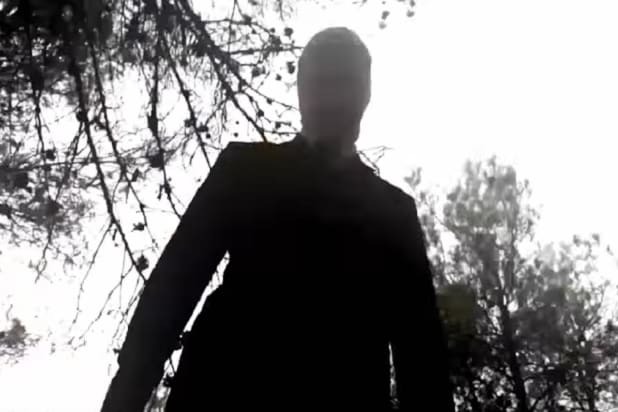 “Slender Man” begins when a group of high school girls decide to look up Slender Man on the internet. They discover a vaguely ominous video that claims to summon the demon, so they watch it. And then they proceed to lose their minds and think that Slender Man is following them everywhere. Katie (Annalise Basso, “Captain Fantastic”) goes missing, Wren (Joey King, “Wish Upon”) goes conspiracy theory crazy, Chloe (Jaz Sinclair, “Paper Towns”) goes along for the ride, and Hallie (Julia Goldani Telles, “The Affair”) gets frustratingly skeptical. Over the course of the film, Slender Man pops up, scares them, drives them nuts, kidnaps them, maybe steals their faces… frankly, it’s hard to keep track. What started as a monster who kidnaps children has been transformed, in this film, into an amorphous collection of random characteristics who does whatever the script tells him to at the moment, whether or not it makes even “dream logic” sense. Even a series of isolated vignettes in which Slender Man scares people might have been entertaining if we could actually see him do it. There’s an old adage in the horror genre that says what the audience doesn’t see is scarier than what they do, and the makers of “Slender Man” have taken that philosophy to heart. You can’t see anything for vast chunks of this movie. It’s so dark we have to take most of the jump scares on faith, and trust that the sting music knows more about what’s going on than we do. Also, it’s never a good sign when the protagonists of your horror movie take a break to watch better horror movies. That’s just what we get in “Slender Man.” Our heroes stop to watch found footage of Slender Man online, and they’re eerier than what’s actually on the big screen. It’s as though the filmmakers are daring their audience to break out their phones and look up more interesting stuff on the internet. The idea behind “Slender Man,” as a movie at least, is that he feeds off of the obsessions of his victims. He’s an intrusive thought, who gains power from fear. It’s a concept that was explored in detail in “The Bye Bye Man” but gets tacked on now without a heck of a lot of thought. At one point Wren tries to explain how Slender Man works by comparing him to a computer virus in the human brain, as though that somehow made sense. You know what a computer virus in the human brain is, Wren? An actual virus. The other problem with a film about “Slender Man,” especially a version of the monster that already exists as an internet meme, is that he’s not an ancient folktale whose origins are shrouded in mystery. He was created in 2009 by a guy named Victor Surge. The information is on Wikipedia. The protagonists of “Slender Man” could have looked Surge up online and asked him all their plot-related questions if they were really all that worried about it. It certainly wouldn’t have hurt the movie to get a little playful and meta, since otherwise it’s a dour slog. But if the point is that Slender Man attacks you if you’re afraid of him, we owe the makers of this movie a debt of gratitude for keeping us safe and sound. It’s slow, it’s boring, it’s underwritten, it’s so dark it looks like it was shot day-for-night at actual night, and the most terrifying moment came when someone dropped a beer bottle at the back of the theater.